Quebec has done important changes to its Training Areas list implying a sustained emphasis on extremely specialized professional training when selecting immigrants who are skilled to the province. The Training List Areas is One of 10 Factors below the points grid of Quebec Skilled Worker Program (Q.S.W.P). It grants a maximum of 12 points depends on the candidate’s college, university, or secondary-level vocational degree from the province of Quebec, or international educational institution. Below the new list, candidates with international graduate, vocational degrees at college-level, or secondary-level in a broad range of areas can get up to 12 points, the most significant score. The foreign-issued degrees number that provides a candidate 12 points constantly continues at seven. 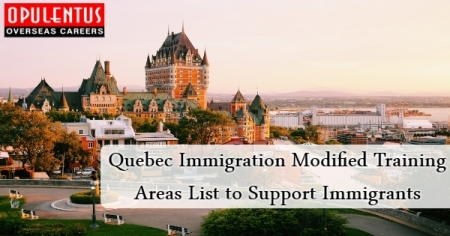 The modified list highlights that plan of Quebec to establish a more extensive and further various pool of skilled worker immigrants by its new system of Quebec Expression of Interest. • Heavy-duty equipment mechanics associated with agriculture. Section B, expressing 09 points in the points grid, includes a broader range of occupations and degrees as related to Section A. A Computer Science or Engineering Bachelor’s degree, which provided 12 points previous, has been transferred to Section B granting 9 points. A more extensive list of qualified secondary-level vocational degrees below Section B will give even those without college degrees an chance to join the candidate's pool fit for selection by draws below the system of new expression of entry. Simultaneously with the modifications to Section C, the combined effect of the changes means that the new E.O.I system signifies a positive move for Quebec trying to obtain international workers. It also outlines new possibilities for immigrants exploring a Canada permanent residence pathway below the system of Quebec expression of interest.